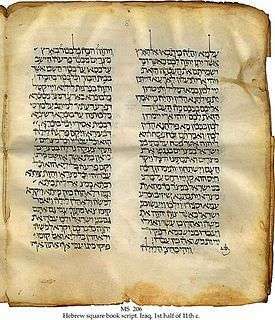 The targumim (singular: "targum", Hebrew: תרגום‎‎) were spoken paraphrases, explanations and expansions of the Jewish scriptures (also called the Tanakh) that a Rabbi would give in the common language of the listeners, which was then often Aramaic. That had become necessary near the end of the 1st century BCE, as the common language was in transition and Hebrew was used for little more than schooling and worship. Eventually, it became necessary to give explanations and paraphrases in the common language after the Hebrew scripture was read. The noun Targum is derived from early semitic quadriliteral root 'trgm', and the Akkadian term 'targummanu' refers to "translator, interpreter". It occurs in the Hebrew Bible in Ezra 4:7 "... and the writing of the letter was written in the Syrian tongue and interpreted ('tirgam') in the Syrian tongue." Besides denoting the translations of the Bible, the term Targum also denote the oral rendering of Bible lections in synagogue, while the translator of the Bible was simply called as hammeturgem (he who translates). Other than the meaning "translate" the verb Tirgem also means "to explain". The word Targum refers to "translation" and argumentation or "explanation". Writing down the targum was prohibited; nevertheless, some targumatic writings appeared as early as the middle of the first century CE. They were then not recognized as authoritative by the religious leaders, however. Some subsequent Jewish traditions (beginning with the Babylonian Jews) accepted the written targumim as authoritative, and eventually, it became a matter of debate. Today, only Jews from the republic of Yemen continue to use the targumim liturgically. As translations, the targumim largely reflect midrashic interpretation of the Tanakh from the time they were written and are notable for eschewing anthropomorphisms in favor of allegorical readings. (Maimonides, for one, notes this often in The Guide for the Perplexed.) That is true both for those targumim that are fairly literal as well as for those that contain many midrashic expansions. In 1541, Elia Levita wrote and published Sefer Meturgeman, explaining all the Aramaic words found in the Targum. An Aramaic Bible is also used in the Syriac Church (see Peshitta). In addition, targumim are used today as sources in text-critical editions of the Bible (BHS refers to them with the abbreviation 𝔗). The two "official" targumim are considered eastern (Babylonian). Nevertheless, scholars believe they too originated in the Land of Israel because of a strong linguistic substratum of western Aramaic. Though these targumim were later "easternized", the substratum belying their origins still remains. In post-talmudic times, when most Jewish communities had ceased speaking Aramaic, the public reading of Targum along with the Torah and Haftarah was abandoned in most communities, Yemen being a well-known exception. The private study requirement to review the Targum was never entirely relaxed, even when Jewish communities had largely ceased speaking Aramaic, and the Targum never ceased to be a major source for Jewish exegesis. For instance, it serves as a major source in the Torah commentary of Shlomo Yitzhaki, "Rashi", and therefor has always been the standard fare for Ashkenaz's (French, central European, and German) Jews. There are also a variety of western targumim on the Torah, each of which was traditionally called Targum Yerushalmi ("Jerusalem Targum"). An important one of these was mistakenly labeled "Targum Jonathan" in later printed versions (though all medieval authorities refer to it by its correct name). The error crept in because of an abbreviation: the printer interpreted the abbreviation T Y (ת"י) to stand for Targum Yonathan (תרגום יונתן) instead of the correct Targum Yerushalmi (תרגום ירושלמי). Scholars refer to this targum as Targum Pseudo-Jonathan. To attribute this targum to Jonathan ben Uzziel flatly contradicts the talmudic tradition (Megillah 3a), which quite clearly attributes the targum to Nevi'im alone to him, while stating that there is no official targum to Ketuvim. In the same printed versions, a similar fragment targum is correctly labeled as Targum Yerushalmi. The Peshitta is the traditional Bible of Syriac-speaking Christians (who speak several different dialects of Aramaic). Many scholars believe that its Old Testament is based on rabbinic targumim, although influenced by the Septuagint, and it is generally reckoned to have been translated between 100 BCE and 100 CE. ↑ Oesterley, WOE; Box, GH (1920). A Short Survey of the Literature of Rabbinical and Mediæval Judaism. New York: Burt Franklin. ↑ Studi di biblioteconomia e storia del libro in onore di Francesco Barberi, ed. Giorgio De Gregori, Maria Valenti – 1976 "(42) Trascrivo una supplica dell'Eustachio al Sirleto : « Giovan Paolo Eustachio romano neophito devotissimo servidor di... (44) « Die 22 mensis augusti 1602. Inventarium factum in domo illustrissimi domini Ugonis Boncompagni posita". 1 2 3 McNamara, M. (1972) Targum and Testament. Shannon, Irish University Press. 1 2 3 Sysling, H. (1996) Tehiyyat Ha-Metim. Tübingen, JCB Mohr. Cook, Edward M. "The Aramaic Targum to Psalms". Targum.info. "Targum". New International Encyclopedia. 1905.